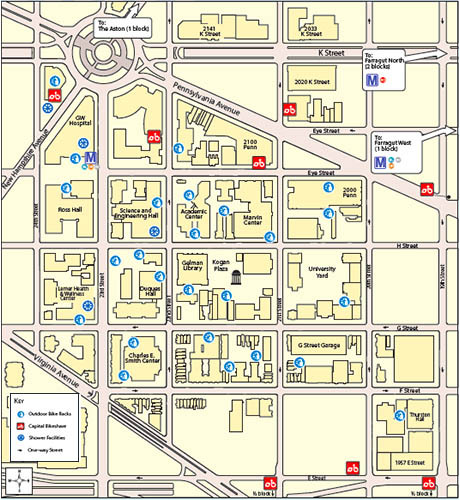 Bike facilities at GW’s Foggy Bottom Campus currently include nearly 700 bike parking spaces, consisting of street-level parking spaces and spaces within academic and residential buildings. Additional bicycle facilities are proposed at the university’s pending development sites. The May 2010 GW Climate Action Plan specifically recognizes the value of amenities for bike commuters and proposes increasing these amenities through the provision of bike racks in university garages and a reduced rate for shower-only Health and Wellness membership for faculty and staff. The Lerner Health and Wellness Center on 23rd Street offers faculty and staff $50 per semester membership for usage of the changing and shower facilities. GW Police Department offers a bicycle registration services. Bike Rental is available from the Department of Athletics and Recreation at the West Hall fitness center on the lower level.